With a design inspired by elegant architecture, this toilet bowl from the Memoirs collection adds versatile style to your bath or powder room. It can be combined with a wide range of Memoirs tanks for a customized toilet. The round front bowl is positioned at a convenient height for comfort and ease of use. Combines with the K-4433 or K-4434 tank to create a K-3986 Memoirs Classic toilet or K-3933 Memoirs Stately toilet. The Archer Comfort Height toilet combines exceptional performance and the enduring transitional style of the Archer collection. Blending subtle design elements found in Craftsman furniture and the intricate facets of fine jewelry, this combination of beveled edges and curved bases creates a timeless look that complements a wide range of styles. Available in an array of KOHLER colors to complement any bathroom decor. This WaterSense(R)-labeled tank combines water efficiency with the versatile style of the Cimarron collection. A 1.28-gallon flush provides significant water savings of up to 16,500 gallons per year, compared to a 3.5-gallon toilet, without sacrificing performance. This tank features innovative AquaPiston technology, a patented flush engine that delivers a fast, powerful, and virtually plug-free flush. Pair this tank with the K-4309 bowl for a complete toilet. With its clean, simple design and efficient performance, this Highline water-conserving toilet combines both style and function. An innovative 1.28-gallon flush setting provides significant water savings of up to 16,500 gallons per year, compared to an old 3.5-gallon toilet, without sacrificing performance. This Complete Solution® package includes everything necessary for installation. Memoirs Comfort Height Round Front Toilet Bowl Only In White With a design inspired by elegant architecture, this toilet bowl from the Memoirs collection adds versatile style to your bath or powder room. It can be combined with a wide range of Memoirs tanks for a customized toilet. The round front bowl is positioned at a convenient height for comfort and ease of use. 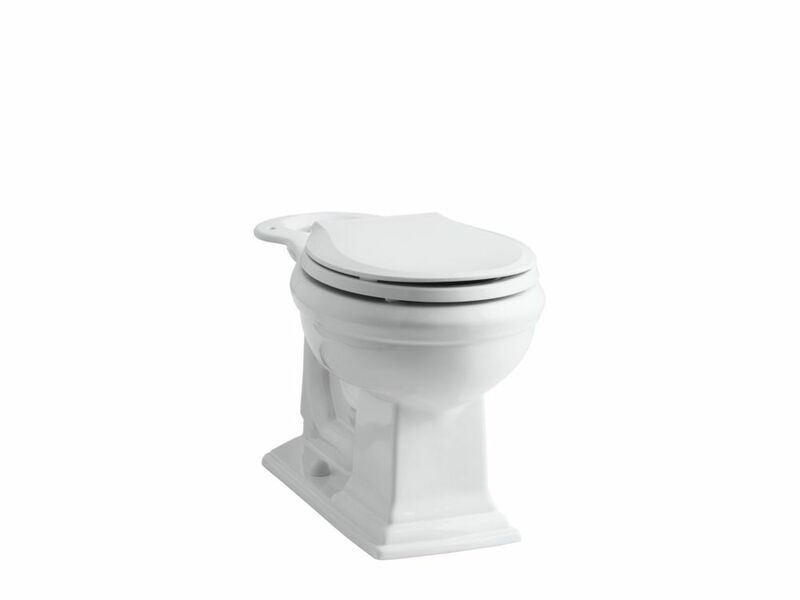 Memoirs Comfort Height Round Front Toilet Bowl Only In White is rated 4.6 out of 5 by 31. Rated 5 out of 5 by Wanda from Very nice toilet. It’s a little more expensive than most... Very nice toilet. It’s a little more expensive than most but I really like it. It has nice styling if that’s important to you in toilets. The height is just right which is important as we get older. I just ordered a second one for my guest bathroom. Rated 5 out of 5 by CoachB from This toilet was a perfect fit for our space and the style matched what we were going for! This toilet was a perfect fit for our space and the style matched what we were going for! Rated 5 out of 5 by JJ from Quality piece and elegant. Good height and efficient flushings. Quality piece and elegant. Good height and efficient flushings. Rated 5 out of 5 by HappyCamper from We purchased two of these to replace "builder's grade" toilets... We purchased two of these to replace "builder's grade" toilets that were in our home for a little over a year. These flush properly and are much easier to keep clean.